Female members of Phryganeidae lay their eggs in a mass of mucus just below the water surface. These egg masses are attached to a surface-usually a branch of an aquatic plant. The larvae then hatch from these eggs and continue to live underwater. This larval stage is the longest stage of the sexual cycle of Phrganeidae. When ready, the larvae turn their protective cases into a cocoon like structure to go through metamorphosis. These organisms undergo complete metamorphosis. Complete metamorphosis means that the larva of the insect looks completely different than the adult form. At emergence, the pupa (refers to the stage of the organism while enclosed and transforming) uses mandibles to break the shelter and swim to the surface of the water. Now, in the adult stage, the cycle starts again! 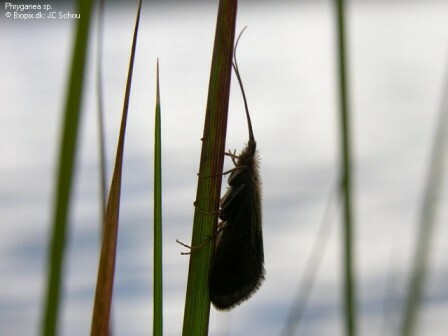 This adult member of Phryganeidae is perched near water where eggs are laid.